Like many people, I have become keenly aware that we cannot carry on living the over-consumptive, wasteful lifestyles that we have been groomed and encouraged to lead. It was with a major overhaul, a drastic remodel in mind, that Theme Room Films took shape in 2007, and that the concept for Greening the Cube: 100-Mile Housing took seed; our plan was to explore and document the efforts of people not so unlike us that are living with a localized focus amidst all the complexity of our ‘globalized’ world. What prompted me to undertake the telling of this story are the people I have been fortunate enough to make the acquaintance of over the past two years. 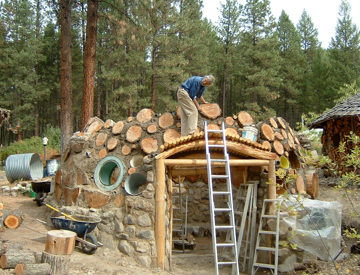 They are builders both alternative and conventional, from builders of innovative, natural homes, to builders of rich, vibrant communities. Builders of ecological economies, and builders of vision, to builders of urban oases found amongst sky-scraped sight-lines. I hope they will serve as an inspiration for you, too, and that whatever you take away from the stories and practices documented in this film will enrich your experience in your own built and evolving environment- whether in housing, community, energy use or the like, there is always room for change, and ideally, room too, for improvement.